Anti-platelet therapies are commonly prescribed for primary and secondary prevention of vascular disease (heart attack, stroke, peripheral arterial disease). But the long term bleeding risks of these drugs are lacking, especially in older adults. Most trials were done in younger individuals, age less than 75, and for follow-up periods between 2 and 4 years. The potential long term benefit of PPIs or histamine receptor antagonists (H2 blockers) to prevent bleeding has also not been studied fully in older adults. Researchers tried to address this void in the geriatric literature. This was a prospective cohort study of 3166 patients who were started or continued on anti-platelet therapy after transient ischemic attacks, ischemic strokes or myocardial infarctions. The majority of patients (>94%) were on aspirin monotherapy. Half of the patients (n=1582) were aged 75 and older and 18% (n=577) were 85 and older. Patient taking anticoagulants were excluded. Researchers reported bleeding events as well as functional outcomes. Study participants were followed for 10 years. Of note, to try and capture a more accurate tally of bleeding events, the researchers used not only administrative coding data, which is what the majority of previous trials used, but also hospital admission, primary care and blood transfusion records. 405 bleeding events occurred during 13,509 patient years of follow-up. 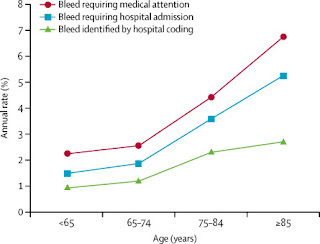 46% (n=187) were considered major bleeds. 40% (n=162) were upper gastrointestinal bleeds. The study focused specifically on upper gastrointestinal bleeds as they could potentially be reduced with PPIs or H2 blockers. After their vascular event, 24% of patients on anti-platelet therapy were also on either a PPI or H2 blocker. 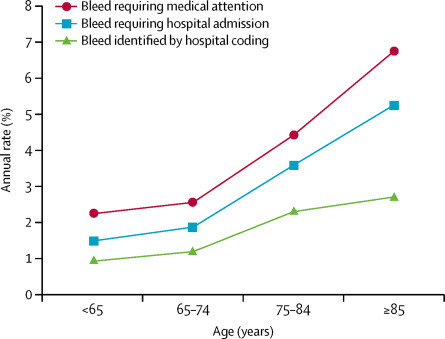 Most notable from a geriatric standpoint - the annual risk for major and fatal bleeding increased steeply with age, after age 75 (figure 1). Compared with younger patients, those aged 75 and older were more likely to experience nonfatal major bleeds (HR 2.62), fatal bleeds (HR 5.53) and disabling bleeds (HR 7.6). At age 85, the annual risk of major bleeding reached 4.1%. And from the additional data in the supplementary appendix, the time to harm, for ASA to cause bleeding, is almost immediate and again, most pronounced in older adults (figure 2). The authors concluded that the risk of major bleeding attributable to antiplatelet therapy approached the risk of ischemic events protected in adults aged 75 and older and was even more pronounced in those aged 85 and older. And specifically for upper gastrointestinal bleeds, the long term risk of disabling or fatal bleed was 10x higher for older adults versus younger (HR 10.26). 53% of older adults (31of 59 patients) had new or sustained disability after upper gastrointestinal bleed vs 14% (3 of 21) in younger adults. And the number of disabling or fatal upper gastrointestinal bleeds substantially outnumbered disabling or fatal intracranial bleeds (n=45 vs n=18). The researchers then calculated the number needed to treat (NNT) to prevent one disabling or fatal upper gastrointestinal bleed after 5 years of PPI therapy. Assuming PPIs reduce the risk of upper gastrointestinal bleed by 74%, a NNT of 338 was calculated for younger adults whereas a NNT of 39 was calculated for patients aged 75-84 and 25 for patients aged 85 and older. The bleeding risks of long term antiplatelet therapy in older adults has been understudied and underappreciated. 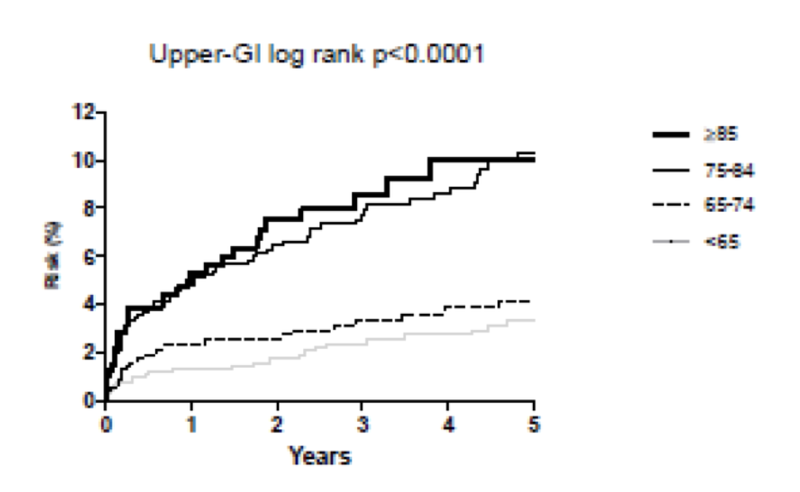 This study provides some real numbers to this risk-benefit analysis, at least for ASA monotherapy in the secondary prevention of vascular events. Through a prospective study, the authors reasonably conclude that the risk of bleeding is significantly increased in adults aged 75 and older and is much more likely to lead to both disability and death. 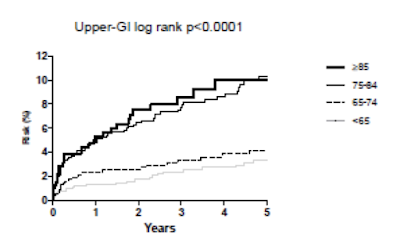 Disability associated with upper gastrointestinal bleeds is another understudied and underappreciated area of the geriatric literature which this study highlights. The authors conclude with encouraging co-prescription of PPIs for older adults on long term anti-platelet therapy, calculating a NNT of 39 for adults aged 75-84 and 25 for those 85 and older. As noted in the accompanying editorial (2), clinicians “obsess" over the balance between the risks and benefits of starting anti coagulation for patients with newly diagnosed atrial fibrillation, using risk calculators such as CHADS2-Vasc and HAS-BLED. Perhaps we should be equally obsessive about evaluating this balance in our older adult population on long term ASA therapy. What do you think? Does this study change your clinical practice? How do you determine when to start or stop ASA in older adults? What about PPIs/H2 blockers? 1. Li L et al. Age-specific risks, severity, time course, and outcome of bleeding on long-term antiplatelet treatment after vascular events: A population-based cohort study. Lancet 2017 July 29. 2. Diener, Hans-Christopher. Preventing major gastrointestinal bleeding in elderly patients. Lancet 2017 July 29. Great summary - and thanks Alan for bringing this to our collective attention. One question that comes to mind is what is the risk of bleeding in similar types of patients not on antiplatelet therapy;. e.g what percent of bleeding events are attributable to the antiplatelet? 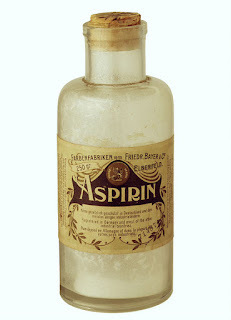 That said, given the large overall risk of bleeds, even if a substantial portion of these events would have happened without aspirin therapy, the NNH would still be substantial .